Sundal is a popular roadside snack from South India (mainly Tamil Nadu). 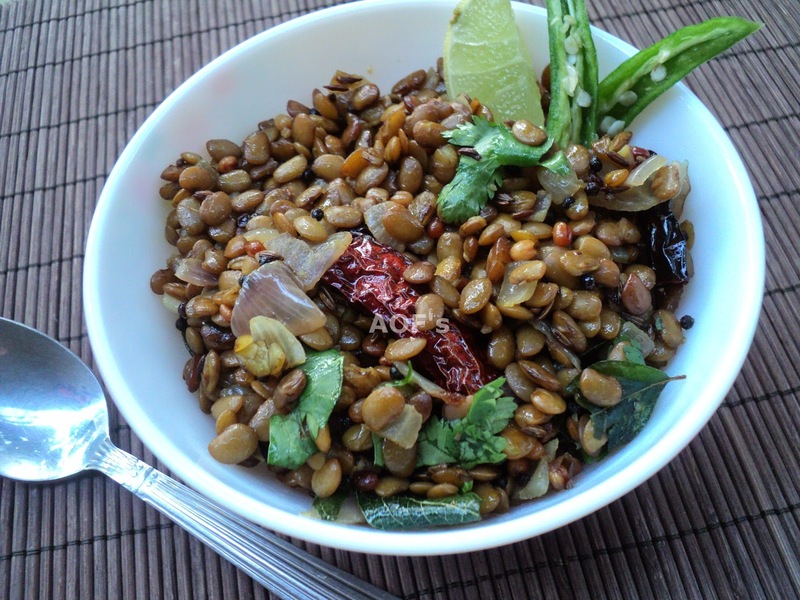 Boiled pulses stir fried with simple spices and garnished with fresh coconut, lemon juice and cilantro, it is high in fiber and low in calories. And quite interestingly there are lots of variations even for such a simple recipe. Some prefer to make it with the sprouted lentils while others prefer to add grated carrots/beetroot/cucumber to it. The regular version has lots of onions (and sometimes even garlic) going into it while the one made on festive days especially 'Ganesh Chaturthi' or 'Vinayaka Chaturthi' is sans these condiments. Click here for more horse gram recipes !! Preparation - Wash and soak the horse gram overnight. Cook it with 2/3 cup water, a pinch of turmeric and salt to taste in a pressure cooker. Allow for 4-5 whistles. Remove from flame and keep aside till steam escapes. Open the lid and strain the boiled lentils. Do not throw the water as it can be used for making rasam. Cooking - Heat oil in a wok. Add the broken red chilis, urad dal, mustard seeds and cumin seeds. Once the urad dal starts turning a little brown, add asafoetida, curry leaves and onion. Fry till onion turns translucent. Add the boiled lentils and stir fry for 2-3 mins. Adjust the salt if required. Remove from the wok and garnish with fresh coconut/cilantro. Serve as a healthy afternoon snack . Note - Add a little lemon juice and finely chopped green chili to add extra zing. Avoid the onions when making it for Navratri or on any other fasting occasion ! !